You are here: REDWOLF > Home > News >News Detail - Video Competition Results - the winners! 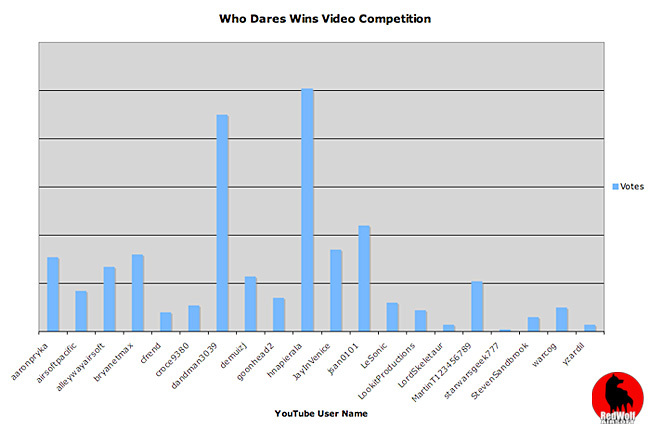 The votes have been counted and the final results for the Redwolf Airsoft "Who Dares Wins" video competition have been compiled into this super sleek graph you see below. The votes were counted from the YouTube comments pages along with the votes from a newsletter survey we sent out to all our newsletter contacts. For most videos, they proved to be as popular with our newsletter contacts as they were on their respective YouTube comments page, although for some videos there were slightly more contrasting views from the newsletter contacts and the YouTube comments pages. As our newsletter contacts represents a large number of people, it was quite a big factor in the final result. However the top 2 videos were quite clear cut, which you can see in the graph below - click to enlarge and see who won the competition! In the end, the winner was quite distinguishable, with the Grand Prize going to a video that we enjoyed as much as the general public did. We were quite amazed by the amount of great videos that we received and would like to thank everyone for taking part in the contest. As the title says, it's a video taken from a first-person perspective, packed with a variety of special effects that envokes a certain emotion inside of you that makes you instantly utter the words "wow". It makes you want to play, and play hard. It leaves one salivating, wanting more. It's the number 1 video, and that says it all. Congratualtions! This video came a close second in the votes for the Grand Prize, thus don't have any hesitations to declare this the most creative video. This stop-animation video blew us away when we first saw it. It has all the right elements and messages presented in an aesthetically-pleasing style. Each frame is taken, one-by-one, then put together to make a moving picture. It takes a lot of time to do it, and much props to dandman3039 for having the vision to do it. Another stop-animation entry, and we have to say that this came a very close second to dandman3039's effort. It has all the right messages and the stop-animation is executed perfectly, accompanied by some superb sound effects. Even though i didn't receive that many votes from the public, our wolves howled in appreciation of this superb video. Enjoy! Made to look like a 2D platform game from the 16-bit era, this is an impressive visual feast of a video that has a cool soundtrack along with great animation that reminds one of the days playing Metal Slug, Contra and such like. A very cool concept and perfectly executed. We thoroughly enjoyed this video, it tickled us silly with laughter, felt sorry for the protagonist as he gets a full-auto round pelting his privates, then cheered when he gets turned into a super cool sniper. The English accent was very amusing, and a bevvy of beauties feature in the video. This video advert features some superb special effects, which gives it the first part of this video a true movie feel. It feels like a movie trailer and apart from that it picks out the best bits of imformation about Redwolf to display. If you have ever seen those erectile dysfunction adverts, you will know what this video is trying to parody. It's done in exactly the same kind of style and we sniggered like little school kids when we watched this one.